The arapaima fish, which once dominated Amazon fisheries, can weigh as much as 400 pounds. 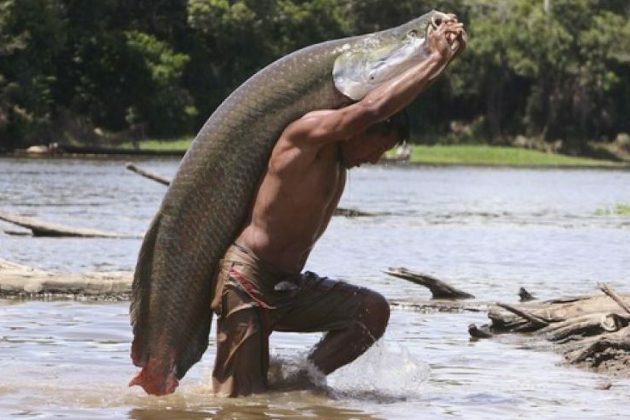 According to the latest study, the researches found that arapaima, the largest freshwater fish species in South America and one of the largest in the world, has become a victim of overfishing and extinct in 8 of the 41 communities in the Lower Amazon region. The arapaima, which can grow up to 10 feet in length and weigh more than 400 pounds, comes to the surface to breathe every five minutes to 15 minutes. The fish’s size makes it easy to find and it dominated fisheries in the Amazon a century ago. But, three of the five known species of arapaima have not been seen for decades, researchers said. "Bioeconomic thinking has predicted that scarcity would drive up fishing costs, which would increase price and help save depleted species," Leandro Castello, an assistant professor of fisheries at Virginia Tech's College of Natural Resources and Environment and the study’s lead author, said in a statement. He said because the tropics contain many species of fish living together, there is no way to avoid catching arapaima. "Fishers continue to harvest arapaima regardless of population depletion. When the mature, large fish are gone, gill nets are used to harvest small fish and these capture juvenile arapaima as well. Eight communities report zero arapaima," Dr Castello added.